My firm, Clock Tower Law Group, stopped filing provisional patent applications (sometimes called “PPAs” or “provisionals”) as a standard practice several years ago. Provisional patent applications are rarely the best solution for our clients, who are mostly small companies. Provisional patent applications work best for large companies with in-house patent counsel. We will still file provisionals, but the situation has to be just right. “Since June 8, 1995, the USPTO has offered inventors the option of filing a provisional application for patent which was designed to provide a lower cost first patent filing in the United States and to give U.S. applicants parity with foreign applicants. Claims and oath or declaration are NOT required for a provisional application. Provisional application provides the means to establish an early effective filing date in a patent application and permits the term ‘Patent Pending’ to be applied in connection with the invention. Provisional applications may not be filed for design inventions. The filing date of a provisional application is the date on which a written description of the invention, and drawings if necessary, are received in the USPTO. To be complete, a provisional application must also include the filing fee, and a cover sheet specifying that the application is a provisional application for patent. The applicant would then have up to 12 months to file a non-provisional application for patent as described above. The claimed subject matter in the later filed non-provisional application is entitled to the benefit of the filing date of the provisional application if it has support in the provisional application. If a provisional application is not filed in English, and a non-provisional application is filed claiming benefit to the provisional application, a translation of the provisional application will be required. See title 37, Code of Federal Regulations, Section 1.78(a)(5). Provisional patent applications cost less than nonprovisional patent applications (i.e. the USPTO filing fee is less). Provisional patent applications expire after 12 months. So you have to make a decision to file a nonprovisional patent application within 12 months of your provisional patent application in order to keep the benefit of the provisional’s filing date. In this way, a provisional is like filing an extension on your tax return. You still must pay the taxes, and you still must file a real tax return. Provisional patent applications are not required to have claims. Provisionals are not examined. A follow-on nonprovisional goes to the back of the examination queue. So if you want to have a patent issue soon, then a provisional is not the way to go. Independent inventors and startups focus too much on the “costs less” part while missing the bigger picture. We have frequently had prospective clients come to us in the 11th month of their provisional’s “patent pending” period and ask us if we can “convert” their provisional patent application to a nonprovisional patent application. Too often, their provisional fails to adequately disclose their invention. In these cases, we refuse to take on the client. I would rather not have a client than have a client with a false expectation of what sort of patent rights exist in a poorly written provisional application. A common belief is that you can save time writing provisional patent applications by omitting the claims. While it is true that claims are not required for a provisional patent application, I believe that it is not possible to write an effective patent specification without writing claims. So here’s my drawing that explains provisional patent applications. And the patent drafting process. 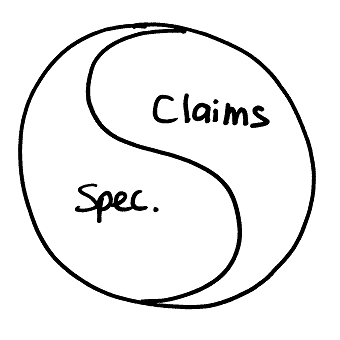 The claims and the specification are the yin and yang of a good patent application. Some patent practitioners insist that you have to write patent claims before writing the patent specification. Others insist that you have to write the specification before the claims. The specification is designed to teach somebody of ordinary skill in the subject matter of the invention how to make and use the invention. The claims are the legalese that formally define the legal scope of the invention. In my opinion, it does not matter whether you write claims first or the specification first. Patent drafting is an iterative process. You must review the specification to make sure that you have fully claimed the invention. And you must review the claims to make sure that they are fully supported by the specification. Compare an invention to a piece of real estate. The plot plan (showing drawings of the house and the property boundaries) is like the specification, the deed (describing the property in terms of metes and bounds) is like the claims. 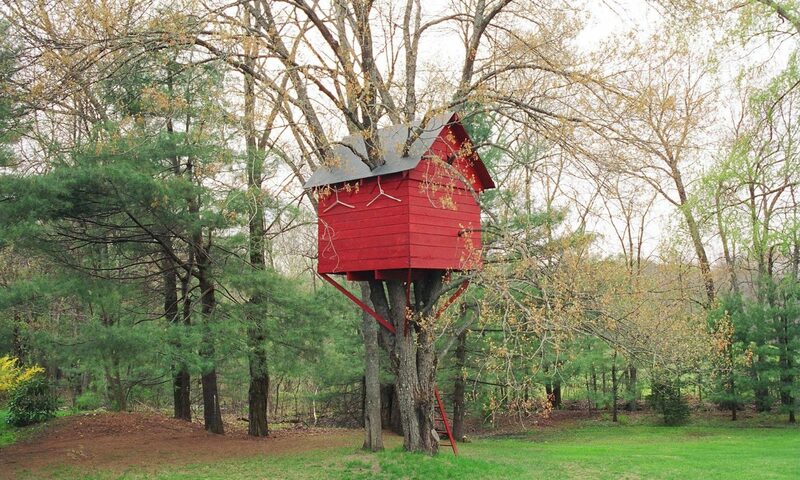 You can also think about the specification as the foundation of the house and the claims as the house itself. A single foundation can support a variety of different houses. But if your foundation is made of sand (as is the case with many provisional patent applications), then you can’t build a strong house on it. When we wrote provisional patent applications for our clients, we found that we were writing claims and then not filing them in order to satisfy our client’s desire to have a provisional patent application. Our provisional patent applications were strong, but we ended up spending as much time drafting provisionals as nonprovisionals. The difference in filing fees between a provisional and a nonprovisional is about $325, but our hourly fees make up the majority of the overall cost. The $325 different does matter when you are filing hundreds of patent applications per year and do so with in-house counsel. In this case, the cost savings of filing hundreds of provisional patent applications can equal the salary for another staff position in your patent department. Which is why companies like Procter & Gamble file lots of provisionals. Patents are designed to disclose the invention so that someone skilled in the art can make and use the invention. At the same time, the applicant is given the opportunity to describe other embodiments of the invention and to explain why the invention differs from the prior art. While it is true that a provisional application need not include all of the formalities of a nonprovisional application, a nonprovisional application that claims the benefit of a provisional’s earlier filing date can only do so to the extent that the provisional discloses and supports the as-claimed invention. As such, strong provisionals are written to look and feel exactly like nonprovisional applications so that the only thing a patent practitioner needs to add are the claims. You can still file a nonprovisional application that claims priority to any provisional application (whether weak or strong), but with a weak provisional as the foundation there will likely have to be lots of new matter added to the nonprovisional application. If the new matter is not disclosed in the provisional application, then the new matter will only get the benefit of the later filing date, which defeats the purpose of having filed the provisional application in the first place. We stopped doing provisional patent applications because they falsely raised the expectations of our clients about cost savings and were rarely the right solution. If you file a provisional application, then it needs to be considered the foundation upon which all future patent applications will be based. If the foundation is weak, then the follow-on applications will also be weak. The cost-savings that might have been realized by filing a quick-and-dirty provisional application are quickly lost when a practitioner has to rewrite everything and start from scratch. Erik, Great Post on Provisional Patent Applications. It was a brilliant piece. I am amazed at how you manage to make any subject you tackle, interesting and engaging. it will be quite a treat. Thanks for the great reading and stellar writing.